Before I go through the last 3 days events, I want to add some info to my previous journals. From May 6-19, the Port Orchard Rotary Club and Hifadhi Africa distributed 48,000 points of maize. I don’t know for sure but I think executing a Rotary Grant in 19 days is probably a record considering the paperwork and logistics involved. The logistics of doing this were far beyond what I had imagined. Seeing the condition of the roads after the recent heavy rains made me realize that a month earlier, it must have been a nightmare. A 20-30 ton truck got stuck and they had to sleep overnight in the truck to insure that the maize was not stolen. But what I left out was that it took 12 men to distribute the maize. On the way to the distribution site, they could sleep on the maize bags in the bed of the truck. But on the way back empty, they crammed 12 men into the cab. It had a sleeping compartment so some we in the sleeping compartment and the rest were jammed into the front seat. Another topic I want to elaborate on is goats. I have been told that East Pokot markets between 400,000-500,000 goats per week. I questioned and questioned that number as that seems like an astounding number. There is a market in Nginyang and each Monday camels, cattle and goats are driven to the market from great distances. Some people essential are full time marketers. After Monday, they walk back to their point of origin, gather more goats and start out on Wed or Thursday of the previous week driving a new herd of goats to market. What really amazes me which I have spoken about in a previous journal is the police. The poor pastoralists cannot make any profit unless they drive their goats 115 Km by walking them along the road. Frankly really pisses me off. Corruption and extortion are killing Kenya. I have asked why it isn’t stopped because you read about it in the newspapers every day. I am told that there is no “political will” to end it. Politicians try to outdo their opponents by getting the media to publish their dirty laundry. So the newspapers I just read talks about a sugar scandal. The current government eliminated tariffs on sugar and sugar was imported by tons and tons. The poor Kenyan sugar farmers were heavily impacted. The figure going around is that the sugar scandal cost $45 million US dollars After 18 months, the tariff was reimposed because of protest by the people. The same kind of thing happened with maize. I asked Collins how he managed to get maize for $30 a bag when the going rate was $50. Answer was that a shortage of maize had driven the price of maize up, particularly in Central and SE Kenya. But in the west in the city of Eldoret there was a surplus because the government allowed Ugandan maize to be imported. The figure going around for the maize scandal is 15 million US dollars. Imports are a big source of revenue because people here don’t pay income tax like we do and absolute control over imports is possible because the government controls the border. And it provides a source of graft money to the government. The figure ground around for the Kenyan Geothermal Development Corporation(GDC) is110 million dollars. Germany paid that amount as compensation and none of the funds have been spent in East Pokot. Back to the police. They seldom arrest people because they are so involved in extortion. But occasionally they do arrest someone. I was told that a Hifadhi Africa person was traveling at night and the police in Nakuru arrested the person. He was told that he 10:00 PM and the police told him that he looked like he was looking for a prostitute and it was nighttime and no one should be out and about at 10:00 PM. They held him for an hour and after he called someone he knew in a local church, he was released. The police love the power they have and they use it to harass people when they feel like it. Another thing that has been interesting has been the weather. This is probably one of the best Tim-dies to come to Kenya as the weather is not yet hot except in East Pokot. It was in the upper 80’s there during the day. But our nights have been cool and a sweater or jacket is required. It is their winter here even though we are on the equator. It is humorous to see people bundled up like it is 20 below zero. Another tidbit is that diplomatic plates for foreign countries are in red with the number 29 beginning the numbers on the American Embassy plates. While driving to Nairobi, we saw 3 American Embassy vehicles pass by us. Also, elected national politicians have sirens and lights on their cars and they are allowed to bypass all traffic. Collins joked that the politicians that passed us were in a rush for afternoon tea. In Kenya, the richest, most privileged people are politicians, not business people like Bill Gates or Jeff Bezos. The traffic in Nairobi is almost always horrible at rush hour and this morning’s journey to the train station took 32 minutes because it is a Saturday. During rush hour the same journey would take 2 hours. My last tidbit is about land squatters. In Kenya, people sometimes just build on land that they do not own. The theory is that if you just build and make good improvements on the land, the Kenyan court system in Kenya in most cases will side with the land squatter. We drove by USIU and there is a huge new wall with concertina barbed wire on top of the wall. I asked why USIU built the wall. Answer land squatters. We arrived in Nairobi and went to the Navias Store. It is a large department store that is very new and very well stocked. Needed to buy some surge protectors for the STEM training and a few groceries. The store has the best licorice I have ever had. The diet went out the window here but it feels like I have not put on any weight. All the activity seems to burn up the caloric intake. The trip to Nairobi was uneventful. The Heart Lodge is like an Oasis. It is wonderful shrubbery, food and lodging. Heart Lodge is a religious based organization and there are religious groups that pass through the lodge while we are there. There was a group from Denver that we chatted with during breakfast. On our first stay here from 17-20 June, the lodge was full. The last 3 days in was empty except for us and Jovenal and his family. So Jovenal, Edrina and Liam arrived 10 minutes after we arrived at 3:00 PM. They had experienced the bus ride from Hell from Kampala. The bus appeared to have mechanical problems from the very start broke down. Jovenal prefers traveling at night because their 18 month old sleeps. They left at 08:40 PM and did not arrive until 3:15 PM the next day. Jovenal will not use the same bus company. Transportation works in Kenya but it can be a challenge. Boda-Bodas(small motorcycle) are everywhere. If you want transport in Nairobi, you generally use a boda-boda. For long distance transport you use the bus. One of the challenges of Hifadhi Africa working in East Pokot is that there is one bus a day. Miss it and you have to stay overnight for the bus the next day. One interesting thing in Nairobi is that Uber is present here. It is cheaper than taxi’s but has its challenges. The Dalai Lama fellowship has you brief a panel on your proposed project. Naomi’s project is a mobile school for East Pokot. Sixty per cent of the children in East Pokot never attend school ever. If a mobile school can say take a young child in for 3 months so they can see the benefits. After 3 months, the plan is to enroll the students into a permanent school. The biggest challenge is fund-raising. Naomi wants to buy essentially a medium sized bus and convert it to a school. I gave her a list of the 74 Rotary Clubs in Kenya and suggested she get on their program schedule. I also told her that I had heard that Korean and Japanese Rotary Clubs do not spent all of their designated funds from the Rotary Foundation. Because they don’t spend it in the year provided, the funds are returned to RI Headquarters. The goal is to complete the project while being mentored by the Dalai Lama Foundation and return in one year to brief the results. If I had to prioritize what Kenya needs the most countrywide is education. In East Pokot the number 1 priority is food and water. You have to be alive to learn anything. Then comes education. On Wednesday evening, we headed out for the RC of Thika Road. Our purpose was to see if the Club wanted to partner with us on the next Global Grant I am working on. They are a new club with only 2 experienced Rotarians. Collins and I each made a presentation. Time was allowed for questions and answers. On Friday meeting we had a meeting with 3 key Rotarians from the club. The 2 hour meeting was a good one and we agreed upon a plan to solidify an agreement. So after talking to Naomi, 4 from Hifadhi Africa and myself headed for the Laico Hotel where the Rotary Club(RC) meets every Thursday at 12:30. I had pre-arranged to meet Ritesh Barot and Justus Marete. I meet Ritesh through Susanne Rea last year. Both of them have had polio. Ritesh is the tallest man in Kenya at 7 feet 6 inches and an investment advisor. I have seen through Facebook that he is a very active Rotarian. We had a pre-meeting where we discussed some ideas I had for Rotary. The RC of Nairobi is the 3rd oldest club in Africa and the mother club of many clubs in Kenya. Justus is the Director of Bethany Kids and he helped John Turmaini apply for a Rotary Water and Sanitation advanced degree for the IHE Institute in the Netherlands. I learned about this opportunity through a close friend, Beth Wilson. The scholarship is not known in the USA. John was the only applicant from sub-Saharan Africa. I told John about the opportunity and he jumped at it. He is the water expert for Hifadhi Africa. It was challenging to get the District endorsement on top of the RC of Nairobi’s endorsement but we got the job done and applications closed 15 Jun. We all have our fingers crossed that John will hear any day now. John thanked the RC of Nairobi for all their support. The RC of Nairobi Is very active in executing Rotary Grants and has been for years. They are maxed out at 10 Global Grants which is the maximum that Rotary will allow a host club to have. I guess I have developed a reputation as a mover and shaker so the President of the RC of Nairobi wanted to talk to me after the meeting. He explained that his passion was sanitation and would I be interested in partnering. He has been involved in putting what he calls large sanitation blocks(high number of communal toilets). He since has sent me some pictures of projects. There is so much need for everything in Kenya and Africa. The speaker for the meeting was an elderly lady who had written a book called, “From Glass Ceilings to Open Skies, Tales of my life”. She had founded a clothing design university which is renown in Africa. Jovenal was able to reunite with a previous President of the RC of Nairobi while he was President of the USIU Rotaract Club. Attendance was sparse as I was told that over 200 Kenyan Rotarians were in Toronto attending the RI International Convention. All and all, time well spent. On Thursday evening we went to the Rotary Club of Gigiri. It also is a new club and has 12-13 members. A number were in Toronto so when 4 of us walked in, we were a large concentration. Rotary members trickled in and by meeting time we had 7 or 8 with 5 visitors. The club meets in the a hotel that is 5 star plus. Some of the hotels in Kenya are even more luxurious that 5 star hotels in the states. Marble is everywhere along with other luxurious interiors. You sure need money to stay in one of these places. One of the things going on in Kenya and the rest of the world is the “World Football Cup”. Soccer is a really big deal in Kenya. When you walk into almost any place if they have a TV, it is on the “World Cup”. Betting is legal and I am told that 99% of the young people from 18-35 bet on the games. The meeting was good and again we briefed on the future Global Grant. One of the founders of this club is David Hastie and I met him in 2013 when he was President of the RC of Nairobi. We celebrated David’s 69 birthday with a cake. David told me an interesting story about rules that Kenya has about adoption. Turns out that Kenya has a rule that if you are an expat., one of the parents must remain in the country with the child. His wife, Jessica, member of the RC of Nairobi had been in Toronto and was returning. He said that they have been fighting it legally without success. There is a 3 year rule that possibly provides an avenue for them to travel abroad. After you have had a Kenyan child for 3 years, apparently they relax the rules. In the meeting was Bruce Foley, a Rotarian from Newcastle, Australia. He has a project that teachers girls in Kenya to be boda-boda drivers. It is a secure way of a steady income because of the high demand for transportation. They provide insurance for the girl in case she gets hurt while learning and they can put a small amount of their income into purchasing a motorcycle over time. Novel idea. 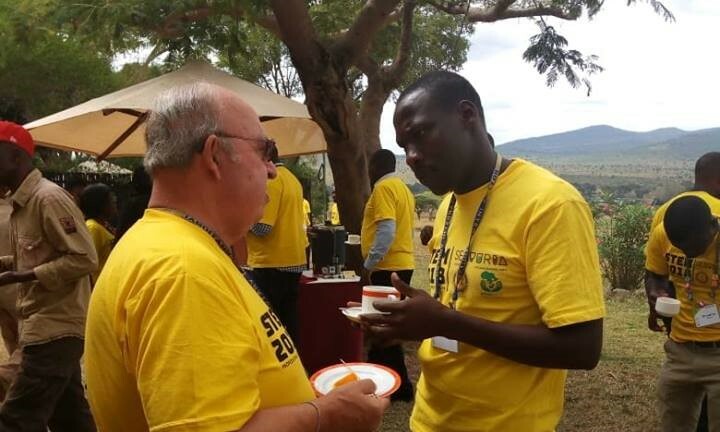 As we were, Bruce was looking to partner with the Rotary Club of Gigiri. Bruce kept using the word, “fortnight”. Anyone know what the word means? We briefed on our proposed global grant and it was well received. We were stranded for a short time at the hotel because Collin’s phone went dead and it was the only phone that had the drivers number. In Kenya, drivers typically stand by while their clients are doing whatever they are doing. We thought he had returned to Heart Lodge but in a few minutes we were off to Heart Lodge for a much needed night of rest. On Friday morning Collins told me that we were going to look at a project. I assumed it was a Rotary project. It turns out that we were asked to look at a business run by a Rotarian and his wife from the Thika Road RC. It was an amazing tour. This couple has taken a one acre plot in an urban location into a tremendously productive growing area. They are surrounded by homes that would market in the USA for $500,000 plus. They started out small and now they now make flour from dried bananas, grow a wide variety of vegetables, raise and harvest catfish, grow bananas, filter and sell bottled water and their next project is banana wine. Their products are all organically grow and gluten free. Maize, sweet potatoes, and other vegetables are planted in the same area. The corn was 8-9 feet tall. They train small farmers how to raise crops and work with them to directly market their products to the consumers. Brokers consume a lot of the profit and their business model bypasses brokers. Their business feeds over 1,000 poor children in schools. They have founded a NGO called IBPROSEP. It was amazing entrepreneurship. They package flour from bananas and other grains for politicians who then use the flour to buy votes. It is amazing to see how corrupt it is to buy votes. The Mathare Valley is one of the oldest and used to be one of the worst slum areas in Nairobi. People live in 6 ft. x 8 ft. shanties made of old tin and mud. There are no beds, no electricity, and no running water. People sleep on pieces of cardboard on the dirt floors of the shanties. There are public toilets shared by up to 100 people and residents have to pay to use them. Those who cannot afford to pay must use the alleys and ditches between the shanties. "Flying toilets" are plastic bags used by the residents at night, then thrown into the Nairobi River, which is the source of the residents' water supply. Approximately 600,000 people live in an area of three square miles. Most live on an income of less than a dollar per day. Crime and HIV/AIDs are common. Many parents die of AIDS and leave their children to fend for themselves. Mathare Community Outreach tries to care for as many of these orphans as possible, but their resources are limited. My first Rotary Grant was in Mathare. I partnered with the Rotaract Club of USIU to establish a library at Kwa Watato Primary School and provide a milling machine to provide income for the school. In 2013 we went to a dedication ceremony for both projects. I wanted to see whether the library was still in existence. Sustainability is the key to any humanitarian work. The school when I first visited it in 2012 was made out of sticks and discarded pallets. The textbooks were magazines stabled together. The Community Grant was for $7000 for textbooks. The school in 2012 had progressed to a building. It was a small building. I will always remember the small children in their bright red uniforms mobbing Chris and I when we arrived. I had 10 kids on each one of my fingers. It turns out that the school had moved to a bigger building and now has over 300 primary and pre-school children. We climbed to the 5th floor of the new building and went to the library. We saw books stamped with “Rotaract Club of USIU”. It was heartwarming to see a project succeed. We headed back to Heart Lodge and had discussions with Jovenal and his wife, Edrina. Jovenal and Edrina met in a UNHCR office in Arua, Uganda, that services refugees. Uganda has one of the largest refugee populations in the world with nearly 1.5 million refugees. Eighty eight per cent of the refugees are women and children(ages 0-18). Almost all are from South Sudan. The atrocities going on in South Sudan are horrible and most of the world knows little about it. The largest one at Arua contains 260,000 and the next biggest has over 100,000. Uganda seems to have a good plan to deal with this mass of humanity. They give the refugees a plot of land to grow food on and a plot to build a house on. They are supported for 2 years and are expected to become self-sustaining. If they don’t, the support is cut off and they are on their own. Uganda is to be commended on their refugee program. I wish I could say the same about the USA. After a long day, we crashed for the night. One thing that humanitarian work will do for you is make you sleep like a rock. Up at 5:00 AM, we headed for the SGR train to Mombasa. Interesting statistic is that the train constructed by the Chinese cost $450 billion. The train earnings for 1 year is 1 Billion. Will only take 450 years for it to amortize. And to add insult to injury, Kenya borrowed $250 Billion from China to pay for the train. But it was a good ride to Voi. While capable of high speed, it rarely reaches anything above 80-90 Km because there are a bunch of stops before Voi. We arrived in Voi and now we await Part 2.